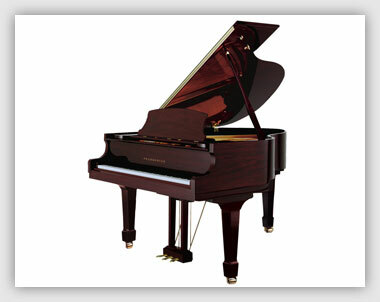 We are proud to carry the Pramberger line of pianos. The “bang for the buck” you get in these instruments is unbelievable. Since there are literally thousands of piano brands, we are not surprised when people say they have never heard of Pramberger, so here’s a little history. The Pramberger family’s history of piano craftsmanship dates back to the late 1700s in the Black Forest of Germany. Johann Joseph Pramberger, born in 1779, began making pianos in Vienna Austria, the Music Center of the World. Joseph Pramberger’s father, Anton, began his apprenticieship at an early age handcrafting fine works of art, becoming a Master Artisan in the tradition of Old European craftsmen. The Pramberger family decided to leave war-torn Europe for the United States at the urging of Anton’s uncles and cousins, who had been working at Steinway and Sons since 1913. Anton had been promised work at the Steinway factory in New York. There, he put his formidable skills to work, dedicating 25 years as a Pattern Maker, designing and creating the complex equipment required to build fine pianos. Beginning in 1958, Anton’s son, Joseph, began honing his craft at Steinway., where he ultimately spent 29 years perfecting his skills. Through his hands-on involvement in every aspect of piano making, he was able to gain detailed knowledge in all phases of fine piano construction and manufacturing. In 1987, after 29 years at Steinway, Joseph, in the tradition of the Prambergers before him, formed his own company, Pramberger Piano Ltd. These pianos are now manufactured by a South Korean company, Samick, in their state-of-the-art, ultra modern facility in Indonesia. Their North American headquarters is in Nashville, Tennessee.